Mares really do rule! In horse breeding, the influence of the mare exceeds that of the stallion -- one breeder told me that the split was 60-40, with the mare bringing 60% to the table. She said that the mare's influence was in part due to her mothering skills. A spooky mare will pass on fears to her baby, for example. I've also read that maiden mares tend to produce smallish babies that grow up to be smallish horses. This suggests that the uterine environment can permanently affect how the baby horse develops. I did not know till recently that the mare is also genetically more influential than the stallion. The X chromosone is the bigger than the Y chromosone, and in the case of horses it carries far more genetic information than the Y chromosone. In addition, the mitochondria (cell organelles) carry genetic information. Most body cells contain as much as 10,000 mitochondria, and mitochondria are passed on to the foal exclusively by the mare. A stallion who really "stamps his get" is something of a freak of nature, as is a mare that is genetically neutral -- letting the stallion's traits dominate. Have you heard the term "broodmare sire"? I talked a bit about this subject in a past article, but it bears repeating. Secretariat was a disappointment as a sire in some respects, as he was not a "sire of sires." His male offspring were not successful enough to make it to the breeding shed. However, he was a good sire of broodmares. How can this be? It's a genetic thing, and one reason, in Secretariat's case, has to do with something call the X factor. Secretariat's heart was measured to be twice the size of a normal thoroughbred horse. Twice the pumping capacity menas greater speed/endurance. 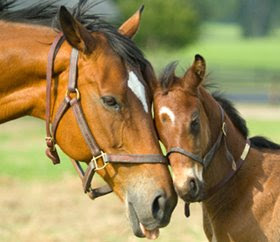 Some horses have this trait -- a big heart, that is -- and they can pass it on to their offspring. Those that do are believed to have the X factor. The term originates from the fact that the large heart is tied to the X chromosone. But Secretariat could only pass his big heart to his daughters! When Secretariat bred a son, his contribution to the offspring was always the Y chromosone, so he had no chance of passing on his big heart. 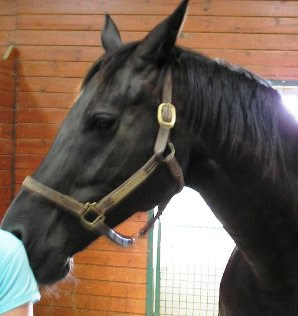 When he sired a daughter, he passed on his X chromosone and potentially the X factor big heart. A daughter that grows up to be a broodmare can pass on the trait to either her male or female offspring (she always contributes an X chromosone). That's how Secretariat's legacy -- lots of really good moms, genetically programmed to pass on Secretariat's big heart. I don't mean to suggest that the X factor is the ONLY reason Secretariat was a good broodmare sire -- the X factor is just a good illustration of the principle. I bought Riley before I understood intellectually how important the mom is -- but I fell in love with his mom, especially her kind eye and lovely face. I had only seen pictures of the sire. Riley has many traits of his mom (neck, size, shoulder, eye, movement), but I think his dad gave him a slightly stronger hindquarter and a more refined head. He has a longer leg and a shorter back than both parents at this point. Time will tell. If you're thinking of breeding or buying a young horse, ask to see the mother and evaluate her as well. Ask about her inspection/performance scores if she is a warmblood. Most warmblood registries recognize a particularly high quality mare through special designations: States Premium for Hanoverians inspected in Germany, for example, or elite mare for Hanoverians in the U.S. If you're not impressed with the mom, think hard before you buy the foal. It's true that maiden mares tend to have smaller offspring, which is one of the reasons we tend to avoid maidens for embryo transfer recepients. My Chance is a perfect example. His mom was a paint and about 15.2 or so. Daddy was a 17.3 warmblood. Chance grew to just "brushing" 15.3 and is built like his chunky mom. However, dad passed on his his lovely neck. Don't know what either one's temperament was like, but I'd vote for good because Chance is a sweetheart, and quite brave. Good points - I didn't know about the X factor thing - good info! Another interesting thing about X chromosomes is that when you have two, some of the genes turn off on the chromosomes to avoid duplicates. Typically a female animal will exhibit some traits, but is capable of passing on different ones as well. An interesting example is the calico cat. The tri-colored fur comes from the two X chromosomes. Male calico cats must be XXY (Kleinfelter's Syndrome). Then there are always mutations! Aren't genes fun! Aside from genes, I wonder how foals might turn out differently if they grew up in a herd. Dr. Sue McDonnell found that stallions baby sit their foals when horses live in herds. Fascinating! Thanks for the great info. Genes are indeed interesting. Oh absolutely. When we bought our "first" family horses, we got two half-sibs -- same dam. The dam was the breeder's top broodmare AND saddle horse, and was still going strong at 22 as a pleasure/trail-hack pet. The two half-sibs have very different sires, but share that old mare's stoic acceptance, polite reactions, and over-all good mindedness. And some conformation things too -- nice neck and shoulder, pretty head but not too fine, big soft eyes, good hind reach. We see our horses' half-sibs through their sires... and there is a much greater difference. When you know who the dam is, it's easy to see where the stronger influence is! Finally someone who agrees with me - Sometimes I think it people all get caught up in the Stallion and forget about the mare! Thank you!